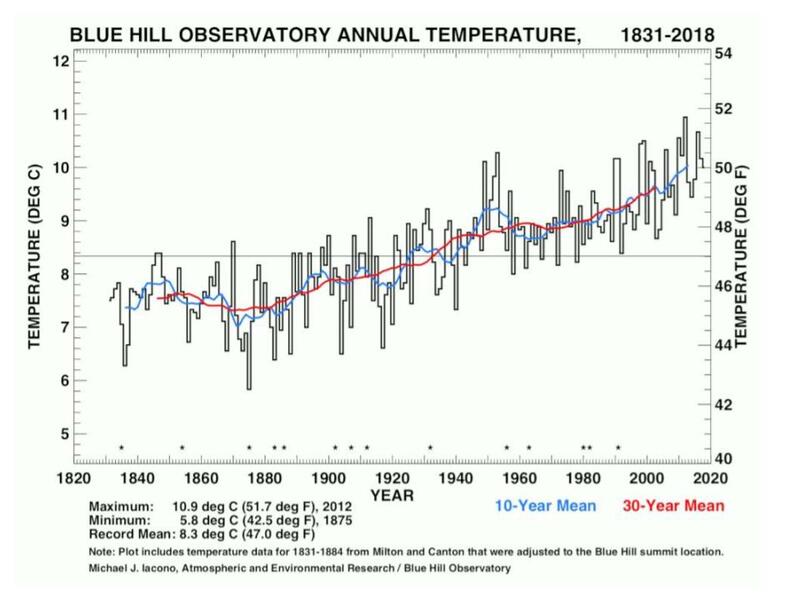 The Blue Hill Observatory and Science Center near Boston is home to the longest continuous climate record in the nation, with observations taken every day for the last 134 years. ​In the past few weeks, we have experienced freezing rain and chilly conditions quickly followed by fifty-degree days and sunshine, an abnormality for February weather. While this may just be a strange pattern, we have experienced this phenomenon over the past few years, and now some are wondering whether it might be a sign of something more. The country has become numb to the term “climate change,” as a result of its constant misuse in American politics. In spite of this, we must reassess whether this topic is purely political, as global changes are already taking place as a result of warmer climates all across the globe. They range from raging wildfires in California, intense hurricanes in Florida, to severe flooding throughout the world. While these changes may seem far in distance and irrelevant to local life, scientists can measure exactly how close to home global warming has already started to hit. Mrs. Assad is the long term substitute filling in for Mrs. Finn while she is away. Mrs. Assad is from Dublin, Ireland. She grew up there and got her education there as well. She has been a long-term substitute in Mashpee for many years. Before she worked in recruitment for administrators and also in accounting. She started with a business degree and background in corporate finance and online marketing. When she moved to America, she became a volunteer for the younger grade schools, until later coming to Mashpee High School. She is also a very proud mother of her two kids. I asked her a few more questions, just so the students can get to know her better. Q: Why did you want to teach? Tuesday night, Mashpee Middle High School kicked off its first ever Science and Engineering Fair, with entries varying to the effects of vaping to the effects of UV light on bread mold growth. The event was organized by Mrs. Soares, a science teacher here at Mashpee, and Mr. Hoppensteadt, the school’s Science Department Head. Every year, Veterans Day weekend is celebrated at Mashpee High Middle School and across the country. Most people see this great holiday as a day to remember and thank veterans that served our country, but what does Veterans Day really mean to Mashpee’s veterans? On Monday, October 29 around at about 9:50 AM at Mashpee Middle-High School, students faced a school weather shut down that is very rare for the area here in Mashpee. An emergency tornado warning was issued by the National Weather Service to every smartphone in the school leading to the entire school being called down to the gymnasium. The gym flooded with students from grades seven to twelve and the whole perimeter of the gym was lined with students sitting on the floor waiting to hear more about the situation. In response to an email-based cyber attack that infiltrated the school, Mashpee School District Director of Technology Mr. Moroney is urging students and teachers to think before you click. The virus caused many students’ and teachers’ accounts and computers to temporarily stop working. The school has addressed the problem, but many are still in the dark about the details of the cyber-attack. In an interview, Mr. Moroney shines light on the subject and what students and staff can do to make sure it doesn’t happen again. Q: What exactly happened in the “email crisis? A: An email came to one of the teachers which was labeled in such a way that she thought it was from a company that she was working. It said “please update your information so we can finish the setup” - it was very clever, actually - so she did that, and part of it was entering her password, and once she did that it immediately gave it (the virus) access to her email username and password. So, what they did at that point, they went in an read her subject lines and her contacts. Once they had that it was a matter of resending messages based on her subject lines, which would look familiar to everyone in the school. Of course, then you’d get people that would see it was from somebody else in the school and then click on that link and then they would be compromised. Then, if she had sent something to a student, then it would push into the student population. It was more of a spam thing than a virus; although it did capture passwords, it didn’t really put any malicious code on anything.